It supplies a balance of valuable plant nutrients. 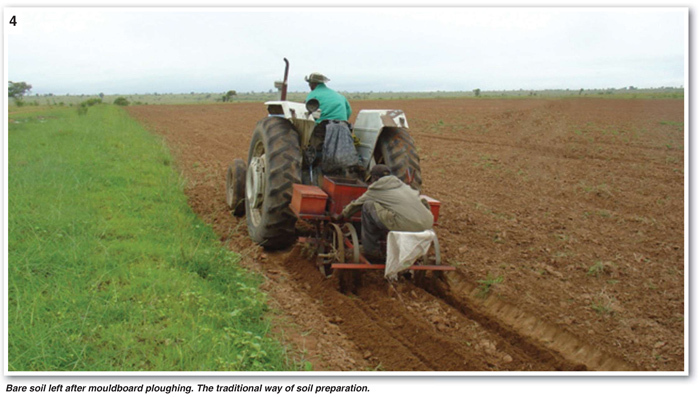 Topsoil provides a seedbed for the germination of seeds (currently an expensive input item) and the establishment of a rooting system for the crop. It supports a complex community of beneficial micro-organisms playing a vital role in the decomposition of plant residues and the recycling of nutrients. I recently read that in 1950, 0,5 ha of arable land were globally available per person. In the year 2000, this area has decreased to 0,25 ha per person and due to the increase of the world’s population, it is estimated that, by 2050, this area will decline to only 0,15 ha per person. We can therefore not afford to lose one more volume of topsoil (Photo 2 and 3). Erosion following uncontrolled runoff water. Water losses from the soil surface, through evaporation, due to direct radiation and heat from the sun. Increased surface sealing due to the direct impact of raindrops during rainstorms which are common in many areas of South Africa. Beneficial micro-organisms are harmed due to the exposure to direct sunlight and heat. 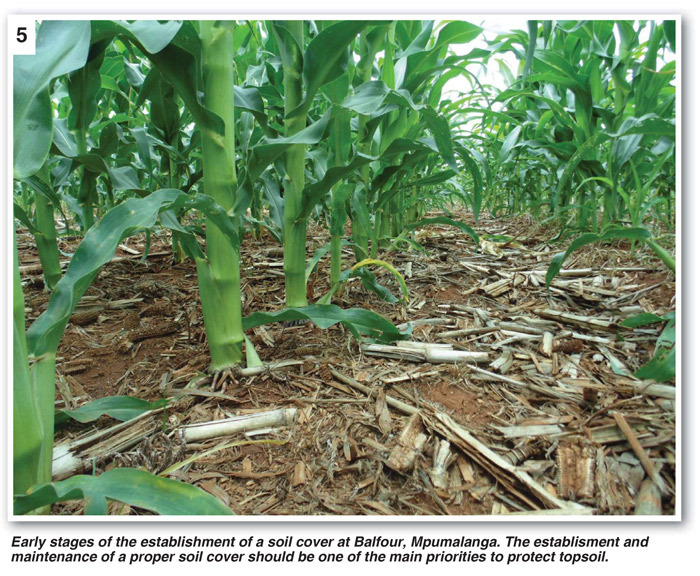 There are two important actions that can be taken to protect and revitalise topsoil. 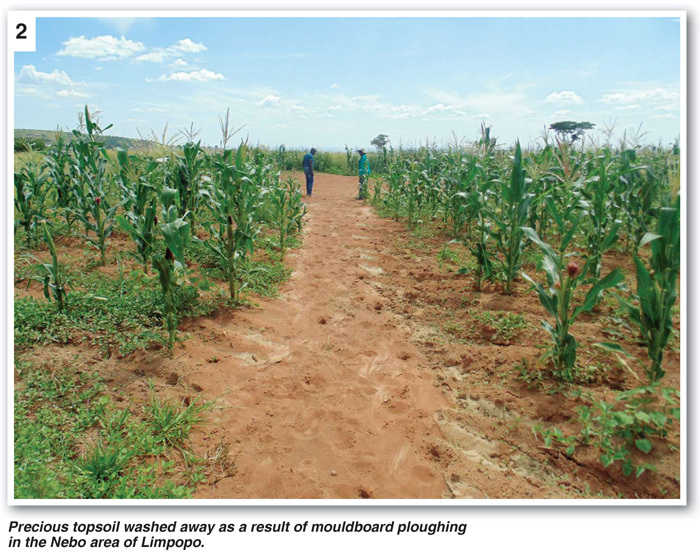 Much more should be done by individual farmers and farmer groups (leader farmers to take the responsibility through purposeful negotiation for funding) to promote proper water runoff control systems at the different farming communities. Where water runoff control structures such as runoff waterways and well-established contour walls exist, ensure to maintain and protect these valuable water runoff control structures. I am convinced that the proper practice of conservation agriculture (CA) that includes no-till, holds the answer to put a stop to the loss of topsoil in our country. Conservation agriculture provides us with the means to protect the land and to work towards the rebuilding of degraded soils. Minimum disturbance of the soil and the establishment of a cover on the surface (Photo 5) and later, a permanent cover of the soil is an answer to protect our land against topsoil losses. In addition, a great benefit of a properly established soil cover, is the contribution it makes to increase soil organic matter (soil organic matter is plant and animal residues at various stages of decomposition), which makes a substantial contribution to soil quality. Helps to prevent surface sealing, runoff and erosion. Supplies energy to micro-organisms in soil. Provides glue to bind soil particles. Helps to improve soil aeration. Acts as a slow-release nutrient store-house. Increases water holding capacity of the soil. 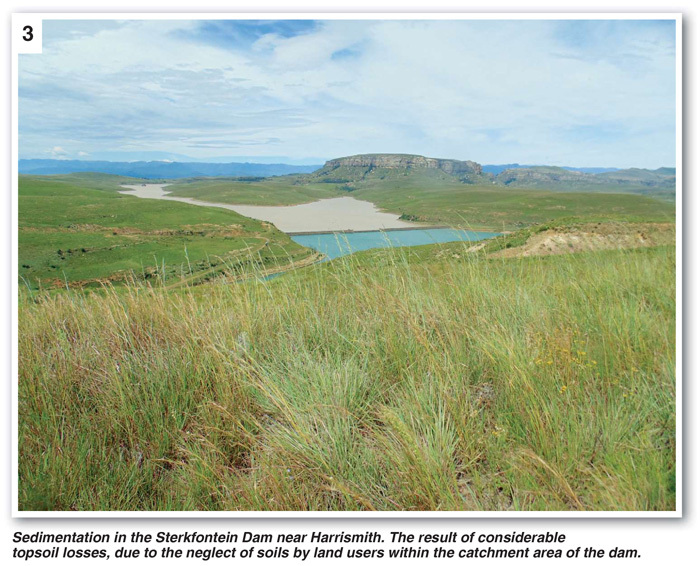 Article submitted by Phonnie du Toit, ARC-Grain Crops. For more information, send an email to dutoitp@arc.agric.